Contrary to popular belief, the mushroom foraging season does NOT end in the winter. 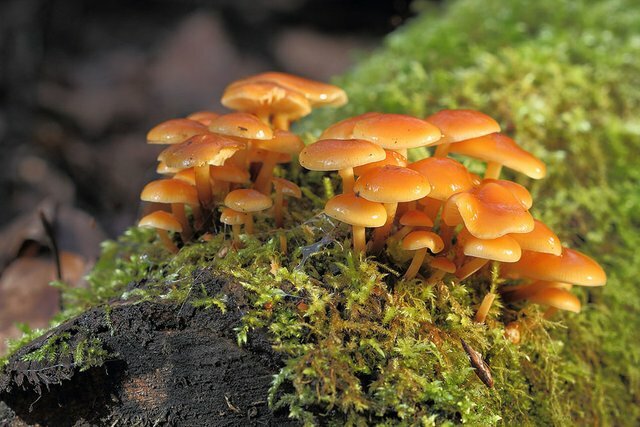 In fact, there are still many fungi that can be throughout found the winter. Below is a short list of just a few fungi that I often find in the winter here in the UK. 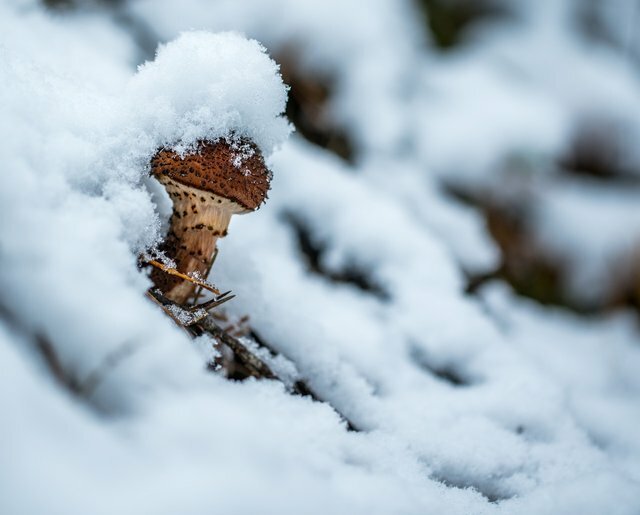 This mushroom not only survives the harsh weather of the winter, but actually thrives in it. This rather peculiar mushroom has made frosts a part of its life cycle. They will often be found in the same place again later on in the spring if a cold snap occurs. The velvet shank is an easy mushroom to identify due to the time of year it grows in but could still be concievably confused with other fungi such as the Funeral Bell and the Sulphur Tuft. The Funeral Bell (as it sounds) is a deadly poisonous mushroom and therefore care should be taken when identifying these fungi. The Velvet Shank will NEVER have a ring on its stem (or any evidence of it ever having one). The young specimens will have a faded yellow colour on the cap and as they mature will turn a darker orangy-yellow colour. The gills on young specimens are white and will eventualy mature to a pale yellow-orange. The stem will start off white-yellow but will mature in specimens and go dark-brown to black in colour. The Funeral Bell does not grow in Winter but care should still be taken. The Sulphur Tuft could also be mistaken for this fungus but the sulphur tuft will have bright yellow to almost olivaceous green gills. The Sulphur Tuft grows all year round. Nevertheless, this mushroom is considered a gourmet mushroom. In fact, the cultivated version of this mushroom (of which it looks nothing alike) is called the Enokitake mushroom and tastes much the same. 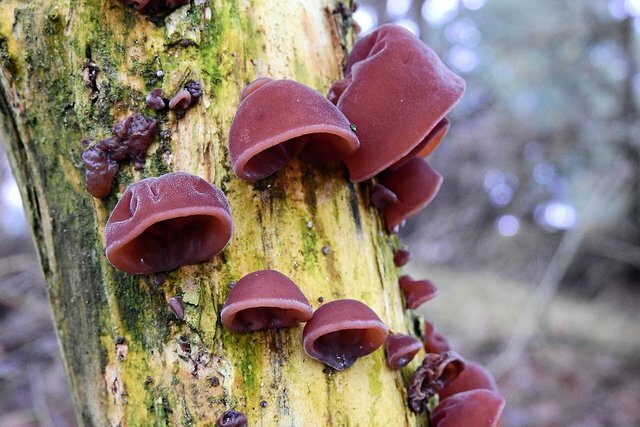 The Jelly ear, also known as wood ear or Jew's ear, is a very common fungus in the UK. During winter and spring, it seems to grow on every dead elder tree, wherever you look! It grows almost exclusively on the elder tree, but it has been found on beech and oak. Despite it being very simple to identify, many people avoid this fungus due to its 'jelly-like' texture. This is understandable and I have, myself, collected and then fried this some of this mushroom and tasted it. 'Interesting' is the word I would use to describe this meal. This fungus is often found in Asian cuisine were it can be found served in many different spiced soup dishes. This is a much better, and nicer tasting method of consuming this abundant fungus. This is another common mushroom which also seems to thrive during the winter and spring months. The oyster mushroom is regarded as a gourmet mushroom due its excellent, mushroomy taste and pleasant texture. The main identification feature with this mushroom, and what seperates it from its nasty cousins, is its size. It is not reccomended to pick an oyster mushroom that is smaller than the size of your palm, for you could concievably mistake it for the Oysterlings. The Oyster mushroom has deccurrent gills (meaning the gills start at the edge of the cap and run down the stem.) The stem and flesh are usualy white. 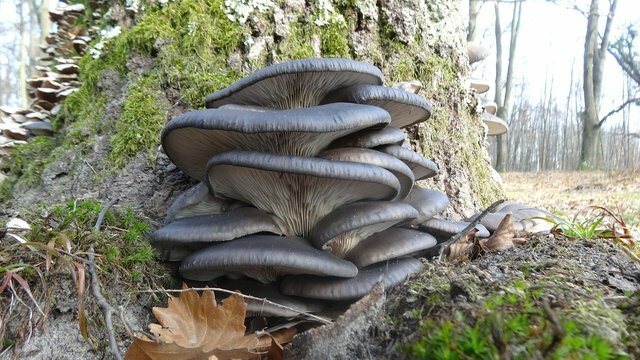 On the grey oyster mushroom (Pleurotus Ostreatus) the cap will be grey and will often fade as it matures. This is a very popular fungus for mushroom growing enthusiasts because it is very easy to grow with little work and attention. The Blewits is a family that I would urge most begginer foragers to avoid entirely (due to the similarity between many of its species with deadly poisonous species such as the webcaps.) The field Blewit, however, is an exception. It grows exclusively in grassland during late autum and winter but is less common than its other popular cousin, the Wood Blewit. The Field blewit is an exception because nothing really looks like it at all. The cap will vary from cream white to brown and its gills are white. The biggest ID feature, is its purple/violet stem. This only discovered when picked but the combination will give you a sure identification of the mushroom. 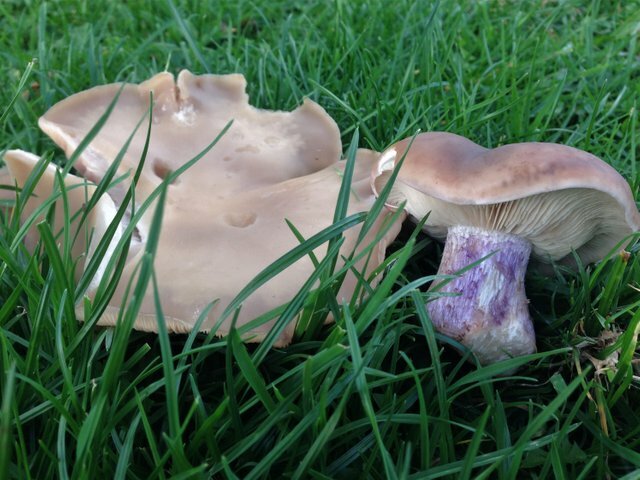 The Blewits are considered grourmet mushrooms and are often served in french restauraunts as Piet Violete or Piet Bleu.